This is another kitbash which I was given recently and thought I’d make a bit of a start on turning it into a finished item. The original idea was for an Akira style ship from the Movie era, plus the original designer didn’t like the Akiraprise and wanted to turn it into something else. The main saucer is a resin NX-01 which has been grafted to the nacelles from a Futura (I think) Constellation class model. There is a roll bar, but not 100% sure where that part came from. Have worked up a set of decals for this model, which since it is from the original release doesn’t include the decals which now come with these models. So the decals were made from scans of purchased one which I have tweaked around to give a different overall look and make them darker. 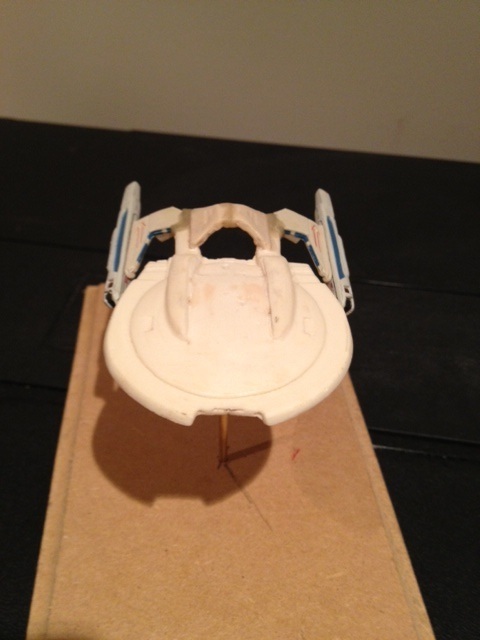 Also added saucer shuttle bays to each side of the top. But other than that no real changes. The model itself was painted Dove Grey so it’s a bit darker than the standard white used for this era of Star Trek ships. As I am aiming for a largish display of ships I don’t want them to be uniform colours as I think that would be a little bit boring. Another Star Trek model in 1:2500 off the production line and this is a pretty simple kitbash of the refit Enterprise kit released by ERTL many moons ago and now re-released by Round 2. The design I’ve claimed this to be is the Jenghiz Class Destroyer and appears in the Jackill’s Star Fleet Reference Manual, Ships of the Fleet Volume 1. It’s actually more like a refit Paladin class as there is no rear facing torpedo launcher, but I just like the designation Jenghiz better. The model was created by taking the matching outsides from the port and starboard nacelles and putting them together to form a symmetrical nacelle. The neck from the saucer was then cut off where it joins the secondary hull and, after a very small amount of clean-up was glued onto the completed nacelle. And that’s really it.